A new and most welcome addition to the Paris skyline, the Fondation Louis Vuitton is finally open after a wait of more than 13 years. From a distance, Paris’ newest museum, the Fondation Louis Vuitton, seems to be floating over the Jardin d’Acclimatation, right by the Bois de Boulogne. Some people believe it is a sailing ship. For others, it is a cloud of glass or an iceberg. But in the end, no matter what their perception of this unusual structure may be, they all agree that the recently opened Louis Vuitton Foundation building is a work of art in its own right. Commissioned by Europe’s richest man, Bernard Arnault, the chairman and Chief Executive Officer of the famed LVMH luxury group, and designed by Canadian-American architect Frank Gehry, whose previous works include the Guggenheim Museum in Bilbao and the Walt Disney museum in Los Angeles, the foundation is intended as a centre of art and culture. The building is placed over a reflecting pool, which creates mirror effects and is composed of 12 huge glass sails, which capture the light in many different ways. Combined together, these elements provide an impression of lightness and volume, as well as a sense of movement. It is of course decorated with “L’s” and “V’s” and aside from the 11 galleries of various sizes that house Arnaud’s private art collection and temporary exhibits, it also boasts a stepped waterfall and an auditorium. 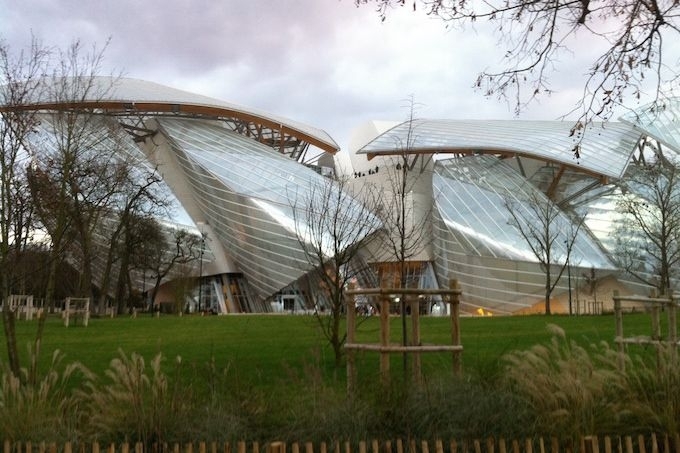 The Louis Vuitton Foundation took 13 years to build and cost more than €100 million. But if some critics have described it as a mere “vanity project” on the part of the French tycoon, it is first and foremost a great addition to the Paris skyline, as evidenced by the number of people who have already lined up to visit the building since its inauguration in late October.